Dixie Perfect Touch Hot Cups. 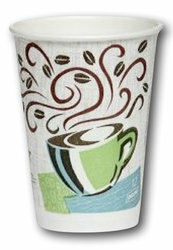 The unique "Perfect Touch" design keeps your hand cool, even when the coffee is very hot. Very popular item that was brought on by multiple customer requests.